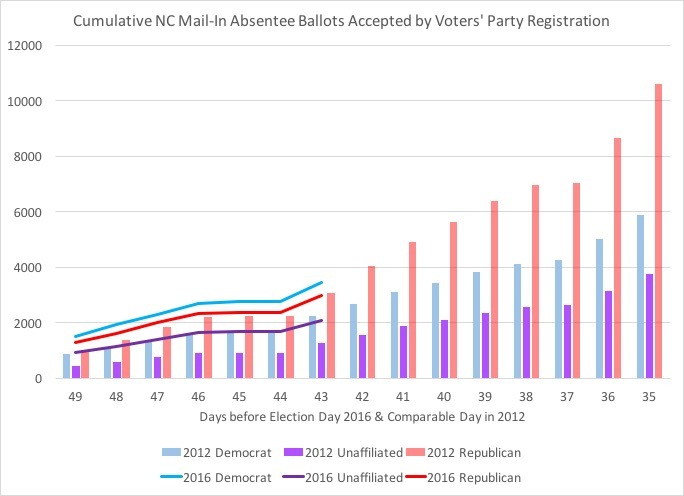 As of September 27, North Carolina absentee mail-in ballots have now reached 69,193~ requests, continuing to outpace the same-day from election day numbers from 2012. 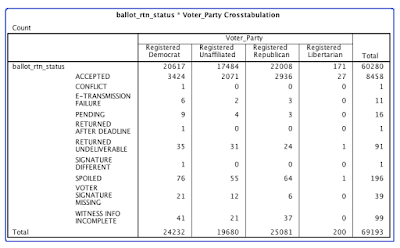 Of the nearly 70,000 requested mail-in ballots, 36 percent are from registered Republicans, 35 percent are from registered Democrats, 28 percent from registered unaffiliated voters, and less than 1 percent are from registered Libertarians. 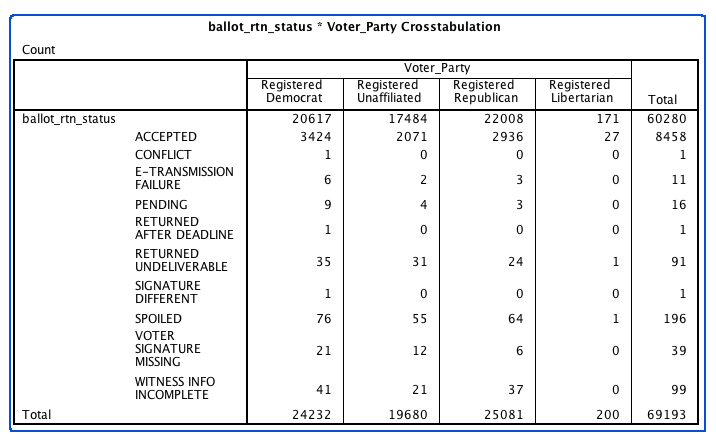 It is interesting that this is the first day in the mail-in period that registered Republicans have taken the lead in terms of requested ballots. 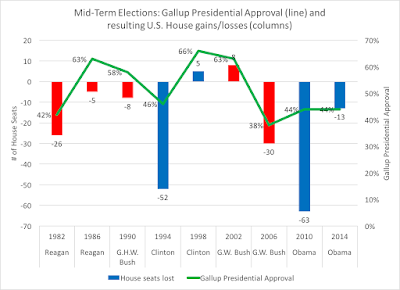 You can see the 2012 performance of both absentee mail-in and in-person ballots cast at this post. 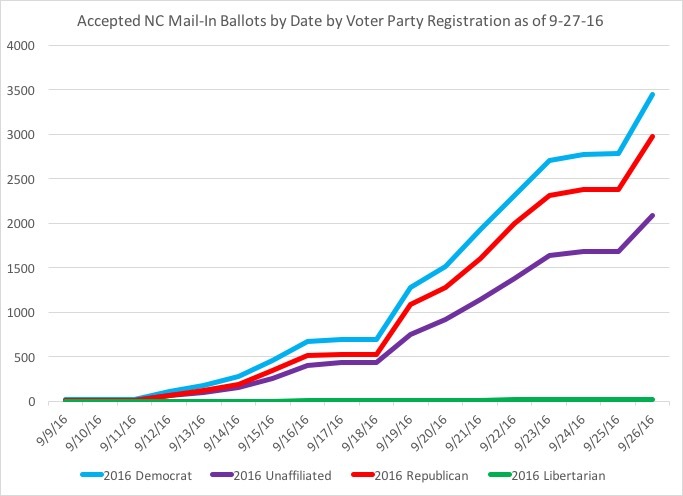 However, among returned and accepted ballots, registered Democrats still hold their lead, which is starkly different than four years ago. 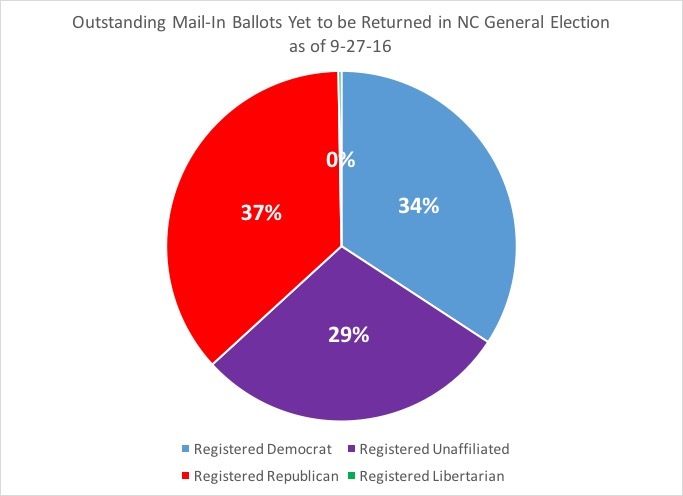 Among returned and accepted mail-in ballots, 40 percent are from registered Democrats, 35 percent from registered Republicans, and 24 percent from registered unaffiliated voters. 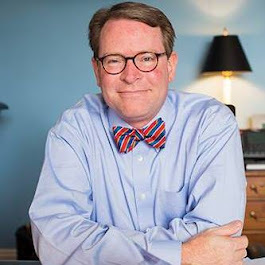 Finally, the outstanding mail-in ballots (that have not been returned) have gone to a slight Republican advantage. If one were to measure the 'return rate' of requested mail-in ballots to those returned and accepted, registered Democrats are at 14 percent, registered Libertarians at 13 percent, registered Republicans at 12 percent, and registered unaffiliated voters are at 10 percent. 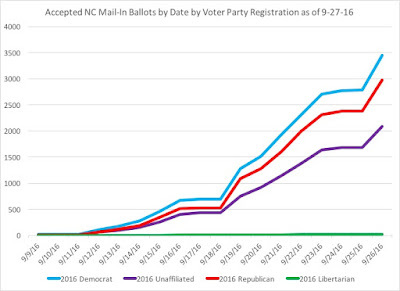 As a final observation, interest seems strong now that we are going into the third full week of mail-in voting in North Carolina. 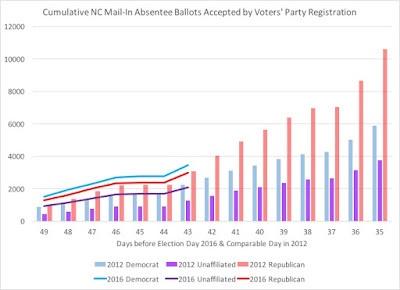 We can't read into vote choices by these, but it is obvious that North Carolina voters are interested in this year's election (from analysis done over the weekend, 30 percent of voters who have cast mail-in ballots did not participate in 2012 or were not registered in 2012). ~ corrected due to duplicate records. *corrected percentages now include both faxed and e-mailed requests for mail-in ballots from 2012.